The building that once housed Jamaica High School (currently the Jamaica Learning Center) is now a city landmark. QUEENS — The building that once housed Jamaica High School, designed by prominent Brooklyn architect William Tubby in the Dutch Revival style, was granted New York City landmark status, the Landmarks Preservation Commission announced Tuesday. The three-story building on Hillside Avenue, constructed in 1896, housed Jamaica High School until 1927. Tubby, known for his historical revival style projects, also designed the Pratt Institute Library in Brooklyn. He chose the Dutch Revival style for Jamaica to acknowledge the area’s earliest European settlers, according to information provided by the Landmarks Preservation Commission. Contrasting decorative details, stepped gables, arched windows and a tall roof with high chimneys are typical elements of the style, according to the commission. "The fact that such a distinguished architect was selected to produce a highly original, distinctive building underscored the prosperity and growth of Jamaica," said Robert Tierney, chairman of the commission, in a statement. "It also shows how serious the town was about educating its children, even as it was on the verge of being absorbed into the City of New York." 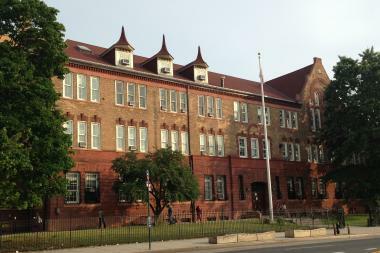 The school, originally known as P.S. 47, “reflected Jamaica's optimism about its future,” according to the Landmarks Preservation Commission. The building, the commission said, "was completed for the then rapidly growing town of Jamaica in Queens County (...), two years before the consolidation of the five boroughs into the City of New York." Jamaica High School was later moved to a new building on Gothic Drive, which is also a New York City landmark. The old building became a vocational school. Currently, it serves as the Jamaica Learning Center, an alternative high school.